C1000 + Bioflavonoids 100 caps. 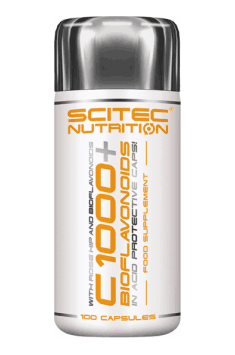 Bioflavonoids, in combination with vitamin C, increase its assimilability. Hesperidin, present in the preparation, thanks to its properties preventing the creation of edemas and decreasing permeability of capillaries, may be helpful for people with sensitive, couperose skin, exposed to freeze, wind or UV radiation. In order to improve the state of skin, it is worth including a preparation with niacin (vitamin B3), which effectively supports maintaining healthy skin. Innovative liposomal formula guaranteeing perfect bioretention; it regulates the work of gallbladder and bile ducts.